Abstract : We present a novel approach to interactive character skinning, which is robust to extreme character movements, handles skin contacts and produces the effect of skin elasticity (sliding). Our approach builds on the idea of implicit skinning in which the character is approximated by a 3D scalar field and mesh-vertices are appropriately re-projected. Instead of being bound by an initial skinning solution used to initialize the shape at each time step, we use the skin mesh to directly track iso-surfaces of the field over time. 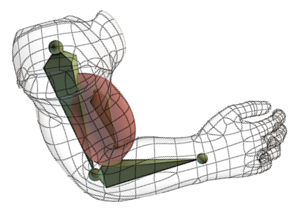 Technical problems are two-fold: firstly, all contact surfaces generated between skin parts should be captured as iso-surfaces of the implicit field; secondly, the tracking method should capture elastic skin effects when the joints bend, and as the character returns to its rest shape, so the skin must follow. Our solutions include: new composition operators enabling blending effects and local self-contact between implicit surfaces, as well as a tangential relaxation scheme derived from the as-rigid-as possible energy to solve the tracking problem.